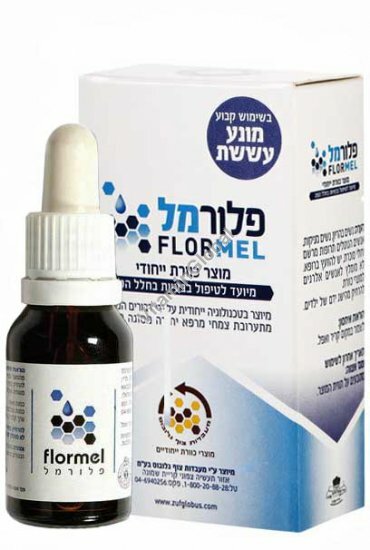 FlorMel treats problems in the oral cavity, such as: aphthas and sores, bleeding and gingival recession, it alleviates toothaches and mouth-aches, helps treat bacterial or fungal infection in the oral cavity and neutralizes bad breath. Mix 20 drops of FlorMel in a tablespoon of lukewarm water, and gargle for at least 30 seconds; you can spit or swallow after gargling. Drip 10 drops of FlorMel on the toothbrush; add toothpaste and brush for 3 minutes, once in the morning and once in the evening. Drip 1-2 drops of FlorMel on the aching area, 3-4 times a day. Mix 20 drops of FlorMel in a tablespoon of lukewarm water and gargle for at least 30 seconds; you can spit or swallow after gargling. Mix 10 drops of FlorMel in a tablespoon of lukewarm water, and gargle for at least 30 seconds; you can spit or swallow after gargling. Ingredients: FlorMel is made from special medicinal honey, produced by bees that had been fed with a unique blend of honey and medicinal herbs, renowned for their antibacterial and antifungal properties. A mixture of medicinal herbs and substances are added to the medicinal honey, including: Eucalyptus, Sage and Propolis extracts, which are also renowned for their antibiotic and antifungal properties. This blend is diluted with alcohol and distilled water.